The technologies for testing the Autonomic Nervous System have evolved tremendously since they emerged more than 10 years ago. The systems are faster, more accurate, easier to operate & integrate multiple testing modalities into one device. 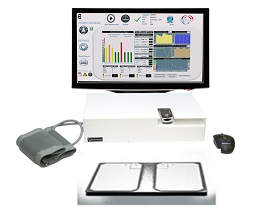 The ANS Sudomotor combined system is the most advanced technology available for Autonomic Nervous System (ANS) testing. The ANS Sudomotor combined device is a revolutionary system that combines multiple parameters into one single system. The system is unique in that it is capable of performing multiple billable studies simultaneous plus offers a unique Cardio Metabolic Risk (CMR) Score. Autonomic Function – sympathetic & parasympathetic monitoring via Heart Rate Variability (HRV). ANS testing is useful in patients with symptoms, chronic diseases & those on various medical therapies (beta blockers, hypertensives etc). Peripheral Arterial Assessment – provides a bilateral peripheral arterial assessment via ankle brachial index to help clinicians identify the underlying cause (vascular or neuropathic in origin) of symptoms of pain or numbness in the peripheral system. Cardiovascular Assessment – provides hemodynamic parameters such as heart rate (BPM), stroke volume, cardiac output, systemic vascular resistance, arterial stiffness, inflammation & detects endothelial dysfunction. **$330+ Reimbursement for 7 Minute Test !! Autonomic Nervous System (ANS) testing is proven to be useful for a variety of clinical applications including identify cardiovascular risk, early detection of diabetes, detection of microvascular & neuropathic disorders as well as help guide pharmacological therapies & lifestyle changes. With ANS assessment, Sudomotor function & cardiovascular function, you will have (arguably) one of the most powerful physiological diagnostic tools to identify the onset or existing complications from diabetic autonomic neuropathy (DAN) & Cardiac Autonomic Neuropathy (CAN). It is well known that from clinical studies that patients with Cardiac Autonomic Neuropathy (CAN) are 2-3 times greater risk of serious adverse cardiovascular events and/or mortality. Other studies show an increase in risk of sudden death to be 5 times greater over 5 years. This represents one of the biggest risk factors in cardiovascular medicine. Assess dosage for beta blocker therapy in patients with vasopressor syncope. ANS Sudopath Complex (ANS + Sudomotor) DEMO UNIT AVAILABLE FOR SALE !! For more billing information, click Billing & Reimbursement.